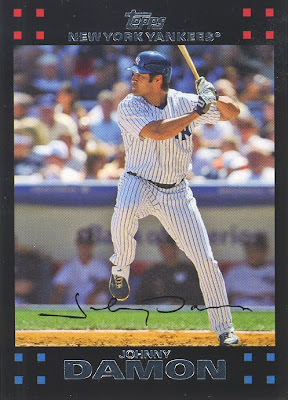 This marks the first and last time Johnny Damon will be the Featured Yankee Card of the Week. Damon is now a Tiger after accepting a one-year, $8 million deal with the help of Scott Boras. Damon, 36, scored 410 runs with New York in four years of service. He also drove in 296 runs and stole 93 bases, while hitting .285/.363/.458. His swap with Derek Jeter at the top of the order may have been the difference that helped the 2009 Yankees take home the trophy at the end of the season. It’ll be interesting to see how much Jim Leyland plays Damon in the outfield. I don’t think the Yankees were really happy when he was manning left field, which is why I thought they were going to bring him back as the primary DH for 2010. But money got in the way of that brilliant idea. I wish Damon the best of luck, just as long as he doesn’t get in the way of the Yankees’ plans of repeating.